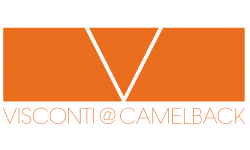 Welcome to Visconti at Camelback! Our Scottsdale, AZ apartments are perfectly situated in Old Town Scottsdale right off Camelback Road. Our convenient location puts you in the center of town with plenty of activities! Shopping is made easy with Scottsdale Fashion Square just a couple minutes away, or you can enjoy the outdoors by going for a walk on the canal or the greenbelt. Our one and two bedrooms for rent can provide a perfect place to call home. We have five layouts that spotlight bright open spaces and modern touches that are great for entertainment and relaxation. We offer classic and renovated apartments to match your taste and budget! You'll feel right at home when you enter our Visconti at Camelback community. Residents rave about our fabulous amenities! We provide multiple pools and spas for you to relax and have fun in. You can host your own BBQ at one of our multiple BBQ stations, or just have them come over to watch a movie in the theater room. Gyms are becoming a standard for apartment communities in Scottsdale so, to show our residents how much we care about them, we also include a yoga studio and clubhouse with a stocked fridge and pool table. Our amenities are in the process of being renovated. Scroll through photos of our thriving community, Visconti at Camelback, located in Scottsdale, AZ. Our leasing office welcomes you to your new home. Call and schedule a tour today!